From local municipalities, to event organizers – the benefits of purchasing a Quench Buggy premium trailer are far-outreaching – from promoting the advantages of tap water, to the reduction in bottled water use. Buying a Quench Buggy for your special event needs is a logical decision with savings both environmentally and monetarily. Service providers – purchase the Quench Buggy and run as a stand alone business. 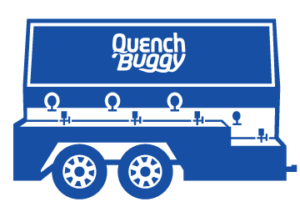 Business owners – extend your current product offerings by licensing the Quench Buggy. For more details on purchasing a Quench Buggy, simply fill in the form and we’ll be in touch. The Quench Buggy is an eight station water trailer with fountains and spigots. The unit can supply endless amounts of water when hooked to a municipal water supply or for remote locations, the onboard stainless steel tank can be filled and water can be distributed that way. This unit has a three stage filtration unit and has large signage for sponsor advertising. This unit is also accessible for small children and people with disabilities. The Quench Cart is a four station hydration station that has spigots for filling bottles. This unit is also equipped with a filtration system and cooling system.